We build our TAA funds including bonds, equities, commercial property and other assets looking over a 12-month time horizon. Our decision-making sequence is first to consider the outlook for each asset class (e.g. government bonds), followed by our views within that market (e.g. the US versus Europe). As these funds are broad-based multi-asset portfolios, we can use a number of levers to both take and mitigate risk over the above time horizon. This may result in positions that differ from other internal portfolios which do not have this range of levers and/or time horizon. In an environment where economic risks are building and global growth is slowing, careful assessment of investment opportunities remains crucial. The change in tone of the US Federal Reserve, and its seeming increased sensitivity to growth and the financial cycle, has led to a fundamental reassessment of risks and opportunities in many financial markets, as the “lower for longer” thesis on interest rates reasserts itself strongly. 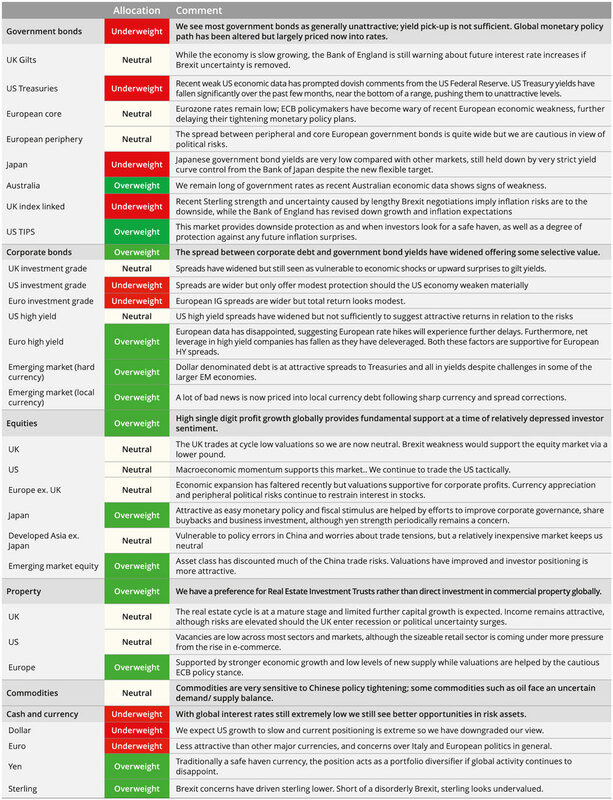 At the same time, whilst political risks have abated, particularly between the US and China, and Italy and the EU, they remain much higher than usual, and unprecedented in certain cases. This means that the balance of risks must be seen as to the downside. However, these risks and changes in economic growth expectations present opportunities in some markets, and an increased argument for active management in others. In this edition of Global Outlook we examine some of the trends, risks and opportunities that our investment managers are currently analysing. Simon Whiteley from our Quantitative Investments team looks at the value factor, and whether it is still a reliable investment lens through which to look at the investment horizon. Our US Investment Grade Credit team analyse the risk of a slowing growth environment on BBB-rated corporate bonds, the lowest rated rung of the corporate bond market, a market which has grown significantly during the last decade. Ben Ritchie, Head of European Equities examines the dynamic political environment and slow growth in Europe, and what that means for equities and stock selection. Notwithstanding trade war-related risks, the US Federal Reserve's more dovish stance, and China's ongoing stimulus program, make Emerging Markets in Asia, as well as elsewhere, subject to easier financial conditions. With this in mind, we publish two articles on Asia, with an emphasis on China. The first from our Head of Strategic Asset Allocation, Craig Mackenzie, who sees a potential value and momentum opportunity in China A Shares. The second article discusses a growing area of interest for our Alternative Investment Strategies team, examining public and private high yield credit opportunities provided by niche investment managers. Finally, Euan Stirling, Global Head of Stewardship and ESG Investment discusses recent auditing scandals, and ASI’s concerns regarding conflicts of interests faced by auditors. He also discusses the recent Kingman review of the Financial Reporting Council which oversees the auditors, and its recommendations. We outline the case, both for and against, buying the value factor book yield (another name for book-to-market). We then discuss alternative ways to implement value that might have more appeal for investors with less tolerance for value’s inevitable drawdowns. the fact that value stocks are sometimes neglected by analysts and investors leading to pricing inefficiencies. Nevertheless value can underperform, or move sideways with volatility, for considerable periods of time and we are most certainly experiencing one of those periods at the moment. For example, as shown in Chart 1, the performance of value in the US has been very disappointing since February 2007, shortly before the start of the global financial crisis. It is informative to look at the cheapness of the value factor compared to history. We do this using a valuation spread, which is defined at a point in time, as the average book yield of the 20% of stocks in a global universe with the highest book yields; divided by the average book yield of the 20% of stocks with the lowest book yields. This ratio is then plotted over time. The higher the ratio, or spread, then the cheaper value stocks are relative to non-value growth stocks. Conversely when this ratio is low, and spreads narrow, non-value stocks, with their superior growth rates, are cheap relative to financially distressed value stocks. When this occurs, it is often problematic for the future outperformance of value. From Chart 2 we can clearly see that at the peak of the Dotcom boom in early 2000, spreads were wide and value cheap. When the boom turned to ‘bust’ and non-value, internet-related growth stocks plummeted in price, value went on to outperform for several years (see book yield in Chart 3). Furthermore, in 2006, prior to the global financial crisis, spreads were compressed, which foretold a period of value underperformance. And now, once again, value is cheap by historical standards. Despite value’s current attractiveness and the strong economic rationale for its outperformance over the long term, there are headwinds against a value renaissance. First, it might be the wrong time in the economic cycle for value to outperform. Value is a cyclical risk factor that generally performs best during periods of increasing economic growth and risk-seeking behaviour by investors. But as the economy slows, it is non-value growth stocks that tend to outperform due to genuine growth opportunities being in shorter supply. If, indeed, we are late-on in the current economic cycle, then this could be an issue for value. But nowadays, company valuations depend more on intangible assets such as intellectual property and trademarks, which are not usually captured by book value. In addition, book yield is intrinsically biased against companies with capital-light business models that can deliver growth without commensurate increases in input costs. So far, we have only talked about value in terms of book yield. But we believe it is useful to view value as a continuum, as shown below. It ranges from cyclical measures of value on the left-hand side to those value factors that also possess quality attributes on the right-hand side. Crucially, each of these value factors has its own risk-return profile. Next, we will look at one particular ‘value-quality’ factor, free cash flow yield, which has some very attractive properties. Note that dividends are viewed as ‘fixed’, in the sense companies are reluctant to cut them. Chart 3 shows the results of a backtest of FCF yield on a global universe. Here, we go long the quintile of stocks with the highest FCF yields, funded by shorting the quintile of stocks with the lowest FCF yields. Rebalancing takes place every quarter. A backtest of book yield is also displayed for comparison purposes. Examining the results, we see FCF yield has a relatively smooth upward trajectory with an excellent information ratio (IR)1 of 1.0. In contrast, book yield only generates an IR of 0.3. There is a very intuitive rationale behind these FCF yield results. High FCF yield stocks often have stable revenues, earnings and dividends and hence perform relatively well during bear markets. Furthermore, the FCF yield still has price in the denominator. This means the factor is biased towards cheaper stocks which tend to do well when economic fundamentals are improving. In addition, further analysis shows FCF yield outperforming during Federal Reserve interest-rate hikes and it appears the factor is not overly sensitive to changes in volatility or macroeconomic shocks. No single factor outperforms all the time, in all market conditions, but FCF yield has generated superior risk-adjusted returns over the past 25 plus years on a global universe. Furthermore, the factor has a convincing investment rationale which insures against data mining. Any basket of value stocks will inevitably contain a number of so-called value traps. These are cheap stocks (according to key valuation metrics), that continue to underperform due to structural problems in the company’s business. An example would be photographic film manufacturer Eastman Kodak in the decade after 2000 when consumers switched en masse to digital cameras. The stock was cheap, but the share price continued to decline due to the company’s increasingly obsolete products. This observation then begs the question - is there any way to identify and remove value traps from a value universe in a rules-based, systematic way, so as to increase the outperformance of value? We believe that this is indeed possible using quantitative techniques. A seminal paper published in 2000 by the accounting professor Joseph Piotroski, then at the University of Chicago, used historical financial statement data to identify value traps based on deteriorating fundamentals such as decreasing liquidity, decreasing profitability and increasing leverage. The original paper was based on an analysis of US stocks, but the underlying methodology can be readily applied to other universes. Backtest results on a global universe are shown in Chart 4. Value traps can be thought of as ‘low quality’ stocks and so the removal of value traps from a value universe is another way of shifting value to the quality end of the value continuum described earlier. “Although Value is currently cheap, it may be the wrong time in the economic cycle for value to outperform"
Although Value is currently cheap relative to history, it may be the wrong time in the economic cycle for value to start to outperform. Furthermore, there are increasing questions in the quant community over the efficacy of book yield as a measure of value. The previous comments notwithstanding, we still believe in value thesis as applied to book yield, but investors should be willing to take a multi-year view and be prepared to withstand periodic drawdowns in performance. As a consequence, investors might want to consider alternative ways of gaining value exposure. This could be achieved by moving across the value continuum from cyclical value towards ‘value-quality’ through targeting free cash flow yield or the elimination of value traps from value universes. Since the Great Financial Recession, BBB US corporate bond issuance has grown dramatically, with implications for investors. As we enter the 10th year of the current credit cycle, BBB corporate debt has increasingly become a focus for investors. As the lowest-rated rung of investment-grade credit, it is generally more vulnerable in an economic downturn. Lower-rated companies typically have less balance sheet flexibility, which could result in weaker credit protection measures for bondholders when the economy slows. During the last downturn, between late-2014 and early-2016, the energy sector experienced over $800 billion in downgrades after the price of oil collapsed. During the next economic downturn, a wider group of companies and sectors could be affected, including the BBB rated portion of the market. Since the Great Financial Recession, the BBB corporate market has grown from under $1 trillion to over $3 trillion. This growth has been fuelled by merger and acquisition-related debt issuance, ratings upgrades and rating downgrades. During 2008 and 2009, the financial sector contributed to growth in the BBB market as companies were downgraded. Since then, the large US banks including Morgan Stanley, Goldman Sachs, Bank of America and Citigroup have migrated back to the single A rating category. In the industrials sector, balance sheet growth has occurred in the past five years. This growth has come from several subsectors including telecommunications, diversified industrials, energy, healthcare and automotives. For example, in the telecommunications sector, AT&T is now the largest non-financial BBB issuer after it incurred significant debt to fund the acquisitions of Time Warner Inc. and DirectTV. Despite the absolute growth in the market value of BBB rated debt in the past decade, the ratings mix as a percentage of the investment-grade corporate debt market has remained constant, at roughly 50%. The growth rate of debt for the top five issuers has grown significantly compared to a decade ago. Unsurprisingly, the capital-intensive banking sector remains the top issuer, followed by the pipeline and telecommunications sectors, which have remained unchanged since 2014. Over the next three years, approximately 21% of BBB corporate debt is set to mature. As interest rates rise, refinancing risk increases. The incremental interest costs from refinancing at higher rates reduces cashflow for many companies. While the Federal Reserve has pivoted to a more dovish tone, the risk for refinancing is likely skewed towards higher overall borrowing costs as spreads follow the ageing credit cycle. Offsetting some of these concerns, corporate fundamentals such as revenue growth, margins and free cashflow have remained supportive, largely driven by a strong macroeconomic environment. However, as balance sheets have become more leveraged throughout the credit cycle, many management teams are focused on leverage levels and are actively working to reduce debt. To date, the number of investment-grade corporate issues that have slipped to high-yield has been muted, helped by the strong economy. Through our fundamental credit analysis, we have highlighted ten companies – including well-known issuers AT&T, Ford and Deutsche Bank – where we are concerned about the risk of a downgrade to high yield. For the current credit cycle, BBB corporate debt could have an unfavorable impact on the lower-rated high-yield market. While the high-yield and loan markets have grown substantially this credit cycle, the BBB rated corporate market is still nearly 1.35x their size. Given the sheer size of some of the large BBB capital structures, an issuer who is downgraded to high-yield would put pressure on the overall high-yield market. It is difficult to be insulated from such a broad adverse event. Nevertheless, we believe thorough fundamental credit analysis and a focus on security selection is helpful in spotting trends before large market-impacting events occur. It is helpful to understand broad trends within the BBB corporate debt market. However, ultimately investors need to delve into the fundamentals on a company-by-company basis. Historical and forward-looking credit metrics such as free cashflow/total debt, profit margins, leverage and interest coverage ratios all need to be closely analysed. Fundamental credit research becomes increasingly important as we move into the later stages of the credit cycle. Knowing the issuer and management is important in assessing credit risk. Additionally, many companies have levers to pull such as reducing share repurchases or dividends to pay down debt. Ultimately, BBBs should not be dismissed with a broad-based brush. Rather, investors are likely to be well-served by applying forward-looking credit views coupled with valuations to make informed investment decisions. Europe faces many economic and political challenges. However, we believe the continent remains fertile hunting ground for bottom-up stock-pickers. International investors pulled more than €50 billion out of European equities in 2018, as they reacted to weakening economic data across the continent. Today, investor positioning in Europe is as underweight as it has been since the Eurozone crisis. It is understandable that investors are wary of a potential economic contraction. At times like this, Europe’s inherent political and cultural complexities can deter the cautiously minded. Coming in a period when the US economy remains relatively robust, and enthusiasm for emerging markets is gathering pace, many are choosing to put European equities in the ‘too difficult’ box. However, we believe there are three primary reasons why investors should take another look at European equities. First, the linkage between European equity market performance and EU GDP growth is lower than might be expected. When one looks on a sector- and company-specific level, there are many businesses that have limited exposure to local economic output. Second, to the seasoned and well-resourced stock-picker who can identify undervalued and overlooked opportunities, Europe’s apparent complexity as a market is actually its great advantage. Third, running focussed, active portfolios gives the freedom to own those companies that offer compelling returns. We only need to own a small subset of the market not the whole index – a subset that can deliver markedly different returns to the benchmark. Looking at each factor in turn. Firstly, the correlation between European GDP and European equity market performance is lower than many investors might expect. Analysis suggests that less than 25% of the Eurozone equity market returns can be explained by GDP. Meanwhile, in aggregate, less than 50% of revenues for listed companies stem from the EU. The correlation can drop much further when we look at individual sectors and companies. The prospects of sectors – in which Europe has many global leaders, such as healthcare, technology and consumer staples – have limited connection with domestic aggregate demand. Instead, they have much closer ties to structural trends. These include digitalisation, an ageing global population and the rise of the emerging-market middle-class. For a company like Denmark’s Novo-Nordisk, the world leader in diabetes treatment, its financial performance is not driven by near-term business survey data, but by tackling a health crisis caused by long-term lifestyle trends. Second, at such times of economic uncertainty, investors often take additional fright at the complexity of the European market. With nearly 20 countries in the benchmark, each with their own languages, cultures and laws, combined with often labyrinthine political processes, the market can be confusing. However, Europe remains one of the deepest and most liquid equity markets in the world. Additionally Europe has a GDP second only to China. For those experienced and well-resourced bottom-up stock-pickers prepared to look through the macroeconomic generalisations and search for non-consensus insights, Europe presents a myriad of opportunities. The complexity that deters others provides the potential for mis-pricing and attractive excess returns. A great example is Italy. Here, we have found a number of fantastic investments in recent years, such as hearing-aid retailer Amplifon. Despite all the economic and political challenges within the country, its business has enjoyed strong growth from an internationally diverse revenue base. It is also benefiting from favourable demographic and technology trends. The consolidation of a fragmented global industry has further driven returns. Fundamentally, Amplifon’s prospects have little to do with Italian GDP. Third, a willingness to run concentrated and truly active portfolios is critical. This allows potential returns to deviate still further from both European GDP and wider European equity markets. A concentrated portfolio doesn’t need to invest in the hundreds of companies listed on the market. Instead, it can hold a much smaller subset. Focussing capital only on those companies that offer the most compelling return opportunities gives the ability to deliver truly active management. In the current environment, a particular focus on those companies with robust business models, strong balance sheets and well-managed environmental, social and governance risks will be important. These provide outcomes that have the potential to be markedly different to those of both the benchmark and the economic performance of the continent. The data suggests investors place too much weight on macroeconomics and political turbulence and not enough on company-specific performance. For the experienced, well-resourced and active investment manager, Europe remains a rich hunting ground for opportunities to invest in companies that can prosper – even in today’s challenging environment. Asia offers important country-level macro factors and idiosyncratic strategy-level factors that could shape the investment landscape and, ultimately, investment returns in the years to come. It is a fascinating time to be considering an investment in Asian ex-Japan corporate special situation strategies, such as direct lending, stressed/distressed credit and non-performing loans, particularly in developing markets. There are important country-level macro factors and idiosyncratic strategy-level factors that could shape the investment landscape and, ultimately, investment returns in the years to come. As background to our ongoing manager selection research in the region, we provide some thoughts on high-level macro crosscurrents that could affect special situation credit opportunities in Asia ex-Japan. We also consider the differences in the structure of the corporate lending market versus the US and Europe. The outlook for the economies of Asia ex-Japan remains influenced by the interest rate cycle and economic growth prospects in the US. The expectation of a more dovish US Federal Reserve, coupled with more stable dollar financing conditions, tends to be viewed as a net positive for the region. This is particularly true for those countries running a current account deficit. We also continue to see policy easing in China, which is positive for the region as a whole. Nonetheless, it is clear that a number of macro risks have appeared during 2018, leading markets to reprice. As one barometer of lending conditions in the region, the yields and spreads on the J.P. Morgan Asia Credit (JACI) High Yield index have increased significantly over 2018. They are now back at levels last seen in the wobbles of 2015/2016 (see chart below). Conditions eased in early-2019 and growth expectations have picked up, but the fragility remains. One important example of the fragile balancing act from a macro perspective is the response of local governments to stimulate growth, while at the same time encouraging continued development of a healthy banking system and local credit markets. In China for instance, in an effort to boost growth and stall a slowing domestic economy, various monetary, fiscal and credit policies have been pursued. Private credit strategies and direct lending to SMEs (small and medium-sized enterprises) could therefore provide investors with interesting opportunities over the coming year. At the same time, it is recognised that poorly performing or non-performing debt needs to be restructured to allow the banking system to regenerate and improve capital allocation going forward. This potentially results in a growing pipeline of distressed debt and non-performing loan investment opportunities. To properly understand and analyse these investment opportunities, it is helpful to consider a number of key structural differences between the high-yield corporate bond and private debt markets of developing Asia versus the US and Europe, as well as differences related to policy and regulation. We consider the following to be of particular importance. The high-yield corporate debt markets are still in a phase of development. This results in a relatively small publicly traded dollar bond market relative to total corporate lending in the region. Most lending is bank-led rather than via capital markets. In addition, unlike the US and Europe where there is a large secondary leveraged loan market, in Asia leveraged loans tend to sit primarily on bank balance sheets. The composition of the US$ Asian high-yield corporate debt market is less reflective of the diversity of the regional economies. For example, one-third of the JP Morgan JACI High Yield Index is concentrated in US$ debt issued by Chinese real estate developers. Liquidity of parts of the bond and loan markets is lower than comparable markets in the US and Europe. For example, trading in the secondary loan market is in its infancy. In the bond space, the more niche issues such as some local government financing vehicles have only a small number of buyers. Various government policies are in place to oversee the continued emergence of the corporate credit and bond markets. Access to these markets requires a good level of understanding of the local framework governing securities regulation and capital flow. For example, in some countries, there is a distinction in access and investment opportunities between onshore and offshore credit markets. However, the distinctions are gradually being relaxed. Across developing Asia, there may also be a stronger relationship/dynamic between the government and private corporations. This manifests in a number of ways, ranging from corporate governance requirements to larger-scale investment opportunities. For instance, the degree to which local SMEs are supported by state banks could affect the opportunity for direct lenders. The rate of non-performing loan sales and pricing are impacted by the degree to which national asset management and other financial companies are focused on selling down the non-performing loan books. There is an evolving legal system for creditor protections and restructuring regimes. For example, India amended its restructuring processes in favour of creditors in 2018, with the goal of shortening restructuring times. In China, a new Shenzhen-based bankruptcy court was instituted in early 2019. Its aim is to provide further support for a growing number of cross-border cases involving both Hong Kong and mainland assets and companies. Hedge funds, private credit and other flexible alternative managers tend to be drawn to situations, regions or asset classes where some form of idiosyncratic risk creates uncertainty. Thus, the crosscurrents in developing Asian economies, in particular stressed credit, are attractive to explore. Opportunities to invest in dislocated credit across onshore and offshore markets are increasing. This requires a good understanding of risk management. Risks range from borrower underwriting, navigating local legal frameworks to hedging local currency risk, whether at security level, or on a ‘look-through’ basis. As developing Asia’s credit markets continue to evolve, there is ample scope for investors to engage with fast-growing businesses and to take part in generational change across these market structures. Our strategic asset allocation view of Chinese onshore equities (China A shares) is positive: the earnings outlook is solid and valuations are extremely cheap. For normal equity markets this combination would often be enough to earn an overweight position in our strategic portfolio. But China A shares are not a normal market. We build our earnings per share forecasts from three component forecasts: growth in revenues, shifts in profit margins and changes in share count. The long-term outlook for corporate revenue growth in China is similar to that for the economy as a whole: lower than in the past, but high by global standards. Structural forces prevent a return to the extremely rapid growth of the past. There is now less scope for catch-up growth, the labour force is shrinking and China must reduce reliance on credit. But, at 6.9% per annum, our 10-year revenue growth forecast for the China A market is well above that of the developed world and many other emerging economies. On the other hand, Chinese companies tend to issue much more new equity than other markets, diluting existing shareholdings. This has detracted hugely from earnings per share over the past 30 years. The good news is that the pace of share issuance has slowed in recent years and is now in the mid single-digits. Given expectations of weaker economic growth, we think it is reasonable to assume this slower rate of share issuance will become the norm. But we assume that even this more modest pace of issuance will dilute existing shareholdings by some 3% a year. This is in contrast with the US market where there are net buybacks, which increase returns by some 1% per annum. The profit margins outlook is negative in the short-term, but fairly neutral in the long run, given that margins are around their long-term average. These three factors combine to generate an earnings-per-share growth forecast of 3% a year. This is not exactly spectacular – and a bit below the 5% or so we have seen over the past few years; but it is solid and better than the outlook for many developed equity markets. The most attractive thing about China A equities is their price – they are very cheap. Using our valuation basket, the market is around 25% below fair value. History suggests that valuations tend towards fair value in the long run. So A-shares should – in theory – benefit from a strong tailwind to returns as the index reverts to fair value. This could add some 3% a year over 10 years. Adding in dividends suggests an expected return in local currency terms of around 8% per annum. This compares to under 5% for global equities. China A shares are riskier than other markets, so on a risk-adjusted basis they are not quite as attractive. Nevertheless, if China onshore equities were an ordinary market, we would likely be strategically overweight. But, to repeat, the Chinese onshore equity market is not ordinary. The long-term returns for A-shares have been disappointing when compared with other markets and in the context of China’s huge economic success. They have a total return of just 3.7% a year since 2000, compared to 6.3% for US equities. The dilution problem, mentioned above, has subtracted greatly from China A total returns, and large swings in valuation are commonplace. As the China A price index shows, for most of the time in the last 20 years this market has moved sideways. But there have been several periods of exceptionally high returns. For example, in 2007 the index grew by over 290% in a year; and something similar happened in 2015, with over 130% growth in 12 months. This is a consequence of the fact that the China onshore equity market is dominated by retail investors, who tend to be swept up in periods of speculative fervour, only to abandon markets in despair after they crash. Prosaic factors such as earnings expectations play little role in this market. This makes China A more of a tactical momentum trade than a conventional, fundamentals-driven strategic asset allocation opportunity. A tactical approach: buying into this market during the early stages of a boom and exiting in a disciplined manner when momentum fades, would have produced exceptional results. But a long-term strategic holding would have disappointed. Today’s cheap valuations provide fertile ground for a speculative momentum rally. But there needs to be a catalyst to reignite retail sentiment. That catalyst may be credit easing. There is strong historical evidence that price momentum in China A gains pace as when credit growth accelerates. When the central bank is easing monetary policy and loosening credit conditions, China A prices surge. The sharp slowdown in Chinese activity in the last 12 months has prompted exactly these conditions. The 25% rally in China A prices this year is consistent with renewed flow of liquidity. The PBOC is unlikely to unleash a huge wave of credit this time – it is worried that the economy has become too heavily indebted. However, economic news has continued to disappoint, so the trend for loser credit looks set to continue for a while. This provides a promising backdrop for the momentum rally to continue for a few more months at least. Confidence in auditing has reached a low ebb, thanks to the high-profile failures of Carillion and BHS. Structural change to the profession is necessary and could already be underway. The auditing profession is under the type of scrutiny and pressure not seen in a generation. The role of auditors in high-profile corporate failures, from HBOS to Carillion, evokes the spectre of Arthur Andersen and its role in the Enron scandal; an episode that led to the demise of both companies. In these extreme cases, weak or complicit behaviour by auditors has drawn attention away from the company directors who were, in fact, the architects of the corporate failure. The core concern of most investors is the quality of auditing, which, when discussed, raises a number of structural issues. Is the concern over audit quality linked to the fact that the accounting profession has consolidated into four dominant global firms? In our opinion, yes. That is why we took an active part in the review of the structure of auditing businesses by the Competition and Market Authority (CMA). It is difficult to find a direct link between quality and concentration. However, our view was instructed by our experience with PwC, one of the Big Four accounting firms. We received a complaint from the chair of the Audit Committee at Vodafone that PwC, having been appointed to audit Vodafone in early 2014, had subsequently taken on the administration of the insolvency of Phones4U. Phones4U explicitly blamed the network operator for its demise. As a result, this raised the prospect of PwC taking legal action against one of its audit clients. We brought up this issue with PwC, both directly and through industry bodies. PwC believed that no conflict of interest existed. Our view is that the consolidation from the Big Eight to the Big Four over many years has led to complacency over standards. We think this is affecting audit quality, which in turn diminishes investors’ and observers’ faith in audits. Chart 1. Can the FRC maintain the momentum? *Includes audits conducted by UK and Crown Dependency audit firms, Third Country Auditors, Local Public Audit and the National Audit Office. Why has the regulator of auditors allowed this situation to develop? The Financial Reporting Council (FRC) is the UK body responsible for regulating auditors. It also applies sanctions when things go wrong. The FRC is an amalgamation of various boards and panels that oversees accounting and auditing standards. Its remit has expanded extensively over time, but on a piecemeal basis. Sir John Kingman conducted a structural review of the FRC. It was no surprise that Sir John’s team consulted extensively with the CMA. The recommendations of the two reviews were published on the same day, 18 December 2018. As a result of the reviews, the FRC will be replaced by a body with statutory authority and much sharper teeth. We believe that public (and investor) confidence in audit is almost as important as the auditing procedures. Conflicts of interest can devalue all the hard work that goes into auditing. There is widespread concern among investors that auditors are too close to finance executives and audit committee chairs. Many believe this affects the rigour that the auditors apply. In addition, as the Big Four have grown, their audit and assurance activities have shrunk as a proportion of their turnover. We believe that the current situation, whereby audit only represents a small fraction of firms’ activities (and apparently a low-margin one at that) is inappropriate. It makes us uncomfortable that the most valuable service that auditing firms provide is the one that appears least economically attractive to them. creation of a successor to the FRC. A further review of the ‘Future of Auditing’ is underway. This is expected to develop the recommendations and review the scope of company audits. The clamour for change to auditing practices reflects a growing demand for the corporate sector to behave with a greater emphasis on long-term success. This has generated an unstoppable momentum which we hope, and believe, will positively change the face of auditing for the next generation.